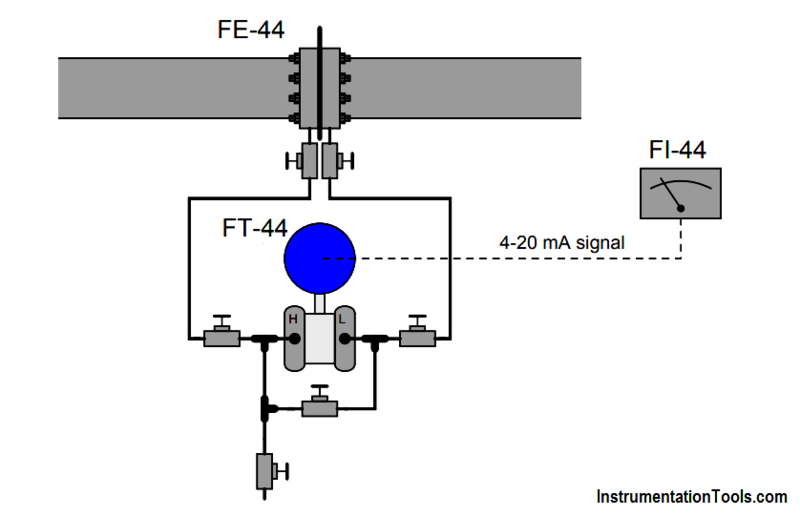 A “smart” DP transmitter with built-in square root characterization is used to measure flow through a pipe. Calculate the largest error, in percent of (output signal) span. Also, determine whether this looks like a zero or span error, and whether that error exists in the input (ADC) of the smart transmitter or in the output (DAC). This is a zero error in the input (ADC) of the smart transmitter, the greatest error being at the 0% point (5.431 mA instead of 4.00 mA = +8.94%). As you can see, the square-root function inside the transmitter exaggerates the sensor calibration error at the low end of the scale. This same zero-shift error of +1 inch WC is hardly noticeable at the high end (20.006 mA instead of 20.000 mA = +0.4% error).